Thai Coconut Noodles with Pan Seared Tilapia: Don’t let the long list of ingredients scare you; this dinner comes together pretty quickly. Searing the tilapia takes only a couple of minutes, and it’s so tasty. Of course, you can use shrimp, halibut, cod, or any other white fish you want. You could even use chicken breasts if you choose. If you want the dish to be vegan, leave the fish out altogether, there’s more than enough flavor without any added protein. 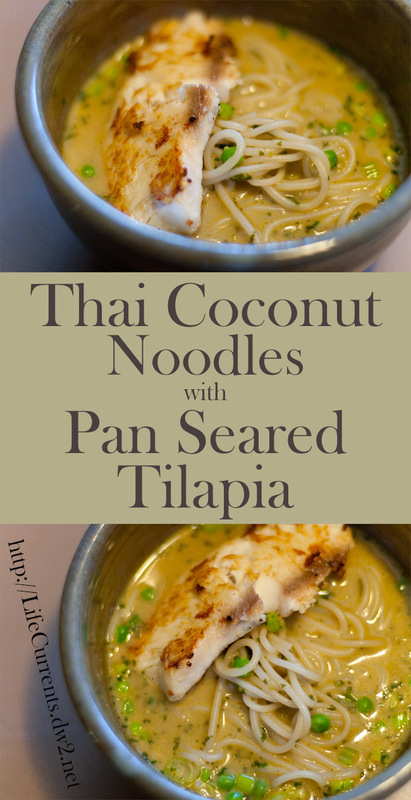 Thai Coconut Noodles with Pan Seared Tilapia… try some new flavors for dinner, you’ll be happy you did! Comes together pretty quickly despite the long list of ingredients, and there’s some yummy flavors going on here! Cook noodles in boiling water according to package directions; drain. Rinse under cold water; drain and place in a large bowl. Combine cilantro and next 3 ingredients (through shallots) in a food processor; process until very finely chopped. Heat a Dutch oven or large saucepan over medium-high heat; add the oil to pan, and swirl to coat. Add cilantro puree to pan; sauté 5 minutes. Stir in broth, sugar, soy sauce, salt, and coconut milk. Add green onions to pan; cook 3 minutes, stirring occasionally. Stir in peas, and cook 3 minutes. Remove pan from heat; stir in cooked noodles. Set aside. Heat a large non-stick skillet over medium-high heat. Add olive oil to pan, and heat until the oil begins to shimmer. Meanwhile, sprinkle tilapia fillets with salt and pepper. Place fillets in the pan, being careful not to crowd the pan or the fish will steam rather than sear (this step may be done in two batches depending on the size of your pan). Cook 4 minutes on each side or until fish flakes easily when tested with a fork and is golden brown on each side. Remove from pan; keep warm. Repeat procedure with any remaining fillets. Spoon coconut noodles into large serving bowls and place a fillet on top of each serving. Garnish with chopped cilantro if desired. Enjoy immediately. This sounds delicious~I am definitely going to be trying your recipe out soon! Grumpy won’t eat tilapia but he will eat cod and shrimp – so I’ll try it with one of those proteins! Debi, this recipe is beautiful! What a refreshing combination of flavors, I can’t wait to make this! Had this for dinner tonight, absolutely yummy. Thanks for a fab recipe.